This German painter, sculptor and illuminator worked around the end of the 14th century. His style had a major influence over subsequent generations of north German artists. 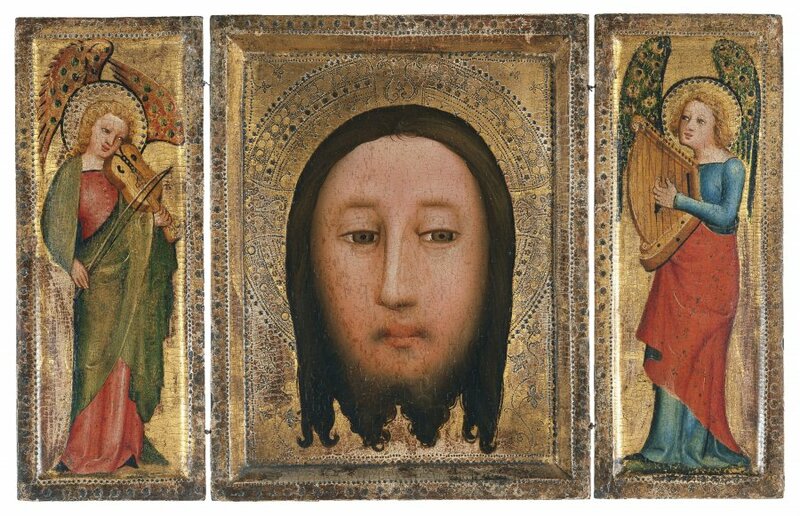 In this Triptych of the Holy Face the artist chose a subject that was particularly popular in the Middle Ages and which is related to that of Saint Veronica’s Veil. Veronica dried the sweat from Christ’s face on the road to Calvary, leaving a miraculous imprint of his features on the cloth. The central panel depicts Christ’s face frontally, with its delicate features and benevolent expression, both characteristic of the artist’s figure types. On the interior wings on each side of the Holy Face are two musical angels against a gold background. Their delicate forms contrast with the two figures of The Annunciation on the exterior wings, which are painted with a heavy, dark brushstroke that gives them a more linear appearance. This small work was designed to be easily transportable as it was intended for private devotional purposes. Master Bertram, who is first mentioned as working in Hamburg in 1367, was from Minden in Westphalia. He produced his greatest work, the Grabow Altarpiece, for the church of Saint Peter in Hamburg. This is a large-scale altarpiece including both paintings and carved, polychrome wood sculpture arranged around a Crucifixion surrounded by a total of 44 figures of prophets, saints and Apostles. The paintings were located in the wings of the altar and narrate the creation of the world and the childhood of Christ in a total of 24 panels. This large polyptych is dated between 1379 and 1383 and is now in the Hamburg Kunsthalle. The Holy Face was a popular medieval motif and is associated with the Holy Veil of Saint Veronica. According to legend Veronica dried the sweat from Christ’s face as he carried the cross to Calvary, and the imprint of his features were left on the cloth. This printed image, which represented the features of the suffering, bleeding Christ crowned with thorns, was kept in Saint Peter’s in Rome until the Sack of that city in 1527. For the central motif of this small triptych, which was intended for private devotional use and was easy to transport due to its small size, Master Bertram chose the image of the Holy Face but without the signs of the Passion. The face is shown frontally framed by the small lateral wings that house musical angels. The artist painted the entire surface with equal skill and made extensive use of the gold and of its applied decoration in the background and on the frame. This decoration also extends to the borders inside the frames which have been reduced on the inside faces of the lateral wings in order for the figures to fit perfectly. The decorative rhythm is interrupted in the case of the central image in order to create a pronounced outline, which functions to heighten the effect of the gold reflections that illuminate Christ’s face with particular brilliance. The features of the face, with its nose slightly inclined to the left, its soft lines and sweet expression, has been seen as typical of the work of Master Bertram. However, significant differences have been observed between the musical angels and the Annunciation figures on the exterior of the doors with regard to the way their garments are depicted. Both the figure of the Archangel Gabriel, painted in silver, and that of the Virgin in gold, make use of thick, dark lines, with abundant, agitated drapery that is quite different to the large planes used for the figures of the angels. 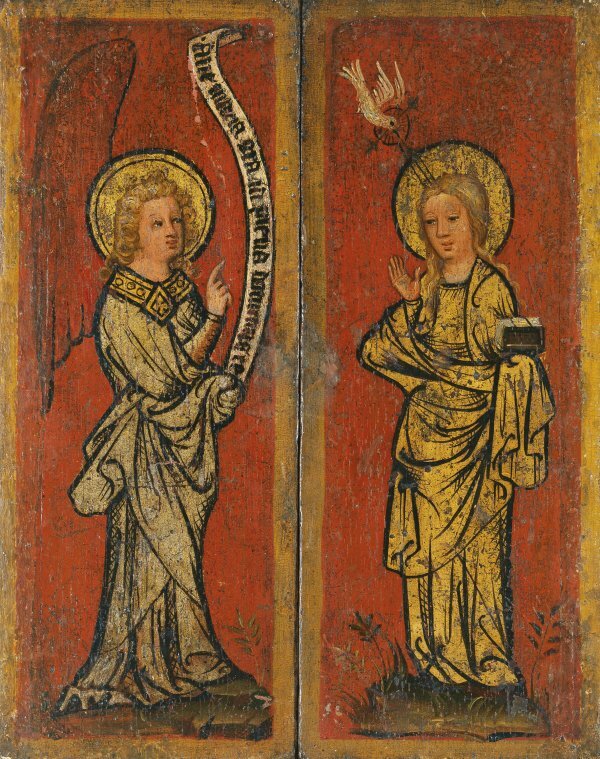 The triptych dates from around 1390–1400. The lateral wings were acquired first, in 1929, and exhibited in Munich in 1930. The central panel was acquired in 1931, completing the ensemble.